Now, if you follow me on Instagram you are probably familiar with this phenomenon (why is she always in a bikini? Here's why) and you might have noticed I got to hang out by a pool this weekend and that is when this delicious, crisp, refreshing wine cocktail came into it's fortuitous existence. 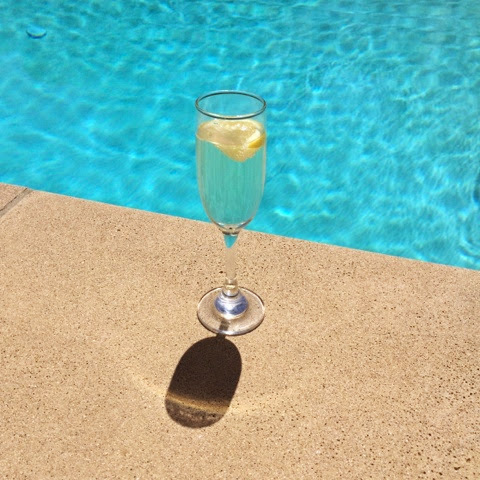 It's tart, effervescent, cool and the perfect accompaniment to a classy pool party. Plus it cuts your booze intake in half and requires ingredients commonly found around the house. It's basically a wine spritzer with a twist (of lemon) ... Pool optional but highly encouraged. Pour a about half a flute of Sparkling water into a champagne glass. Squeeze out the juice of a lemon wedge and then add it to the glass. Top with champagne, apply SPF and enjoy.